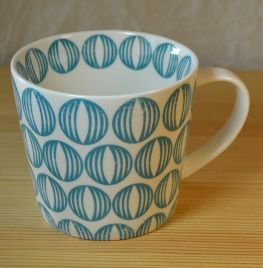 Ceramic Mug from the Skane range - with Segment Teal pattern. Capacity of 350ml. A good sized mug, with a lovely retro style repeating pattern. Dishwasher & microwave safe. This design has a worn or faded look - so expect variation and a distressed look.